Towards Derby, we sought out the other 2 locations which Dave had suggested, The first would have been similar to Langie Crossing but we were stopped 1 km short by a nasty dry creek bed with steep lumpy sides which we chose not to risk. We didn't have to go there so why should we take any unnecessary risks? A roll over in your driveway would be bad enough, but 3000km from home? Not a good thought. We were overtaken by Oka 212, who we had seen in Broome, while slowly climbing up to speed out of Willare Bridge. The second location we sought looked promising, Munkayarra Pool 20 km south of Derby. 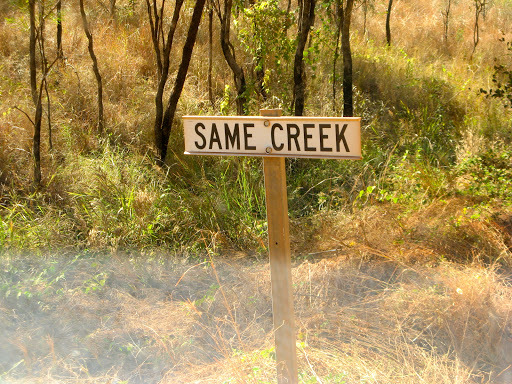 Unfortunately there was a new gate across the track and the aboriginal community had erected a Private Property sign. We later learned that as leaseholders, they could not prevent people visiting the lily pool (which is a public reserve) but camping was no longer allowed there anyway, which is what we were looking for. 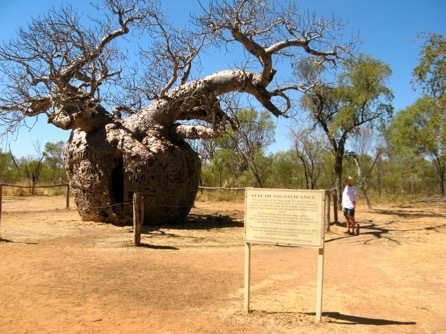 We called into the Derby Boab Prison Tree to find that it's now an Aboriginal "site of religious significance", presumably due to the large number of their ancestors that had been incarcerated therein. After the usual call into the tourist office (to cool down more than anything, it was pretty hot in Derby), we visited the Wharfinger House museum, which was quite good, once we'd found the door which fitted the key we'd been given. As we were returning the key, a Toyota pulled up along side us. It was the Kiwi couple who we had met at several places over the past month. They are either stalking us or vice-versa but we agreed to meet up and camp with them at May River, about 30km east of Derby. I emailed Dave about the locations he had suggested and he called to suggest we contact his mate Peter, who was also a Derby councillor. Peter invited us around to his house for a chat and a cool drink. We spent a pleasant couple of hours with Peter and Kath in the shade of their house on stilts, discussing the tourist scene in Derby and the unreasonable stance taken by various state departments on fire and water management in the Kimberley region, sitting as they do in their air-conditioned offices in Perth, 3000km away from the action. It also transpires (and we found this from several sources) that in areas now covered by Native Title, the erection of signs prohibiting entry may not be strictly legal and since former tracks and access roads can't be closed off but permits may be necessary to use them. It seems that aboriginal communities are stretching their entitlements. It's a very long way from the Eddie Mabo determination, when all he wanted was the title to a block of land previously "owned" by his father and left to him, to around 1/3 of the country now handed back to people who you never see, who don't need it and won't ever use it. Peter and Kath did invite us to camp in their back yard but we had already made arrangements with the Kiwi couple (who we now know as Curla and Raewyn) to camp with them at May River so we departed as the sun was going down, arriving just in time to find a campsite on the rocky rivers edge. We had a very enjoyable evening with Curla and Raewyn, with wine and a campfire (it turns out they own a pub in NZ) and it was not even totally ruined by the continual stream of heavy water tankers who arrived at dawn to fill their tanks from the river. What a wonderful soothing outback sound it was, diesel engines at dawn. They were working on a road upgrade and the water is sprayed everywhere, to reduce the dust hazard but increase the mud hazard. What a wonderful soothing outback sound it was, diesel engines at dawn. 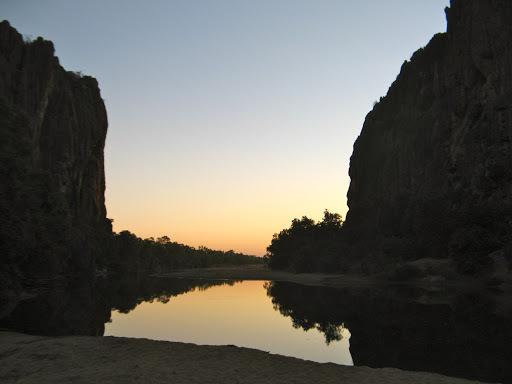 But by mid morning we had seen enough water tankers, no wonder the water level in the river was low, so we departed, C&R to Lennard Gorge and us to Windjana Gorge. 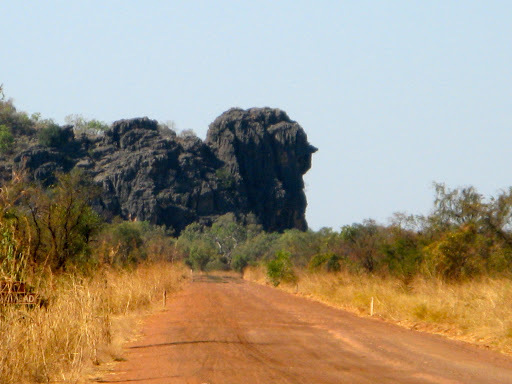 On the way we passed Queen Victoria's Head, a prominent and natural rock feature above the road. The final 20km to our gorge was terribly corrugated and I had to drop the tyre pressures to sand dune level to try to smooth them out. It didn't work. There were few people at the campsite but by dusk the place was packed out and I was not enjoying it at all. It's getting as bad as Cape York and I think we'll have to find more sparsely populated parts of the country for future adventures. 8 days without seeing a soul, that's our kind of remoteness. To make matters worse, the costs have sky rocketed. Even with all our concessions it still cost $21 for one night in a national park campground, which is getting ridiculous. Without concessions it would exceed even a Big4 Caravan Park and they are expensive rip offs anyway. 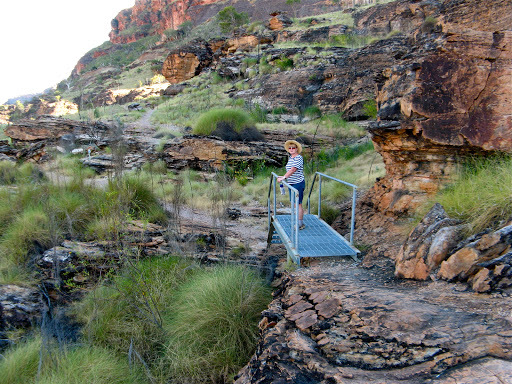 Luckily we have been here a few times before so this might well be our last visit to the Kimberley. Before dusk we took a quick walk to see the gorge at sunset. A slightly better day today. My back is much better now and we did a long walk into the Windjana Gorge and saw a few crocs, but nothing like the number we saw a few years ago. 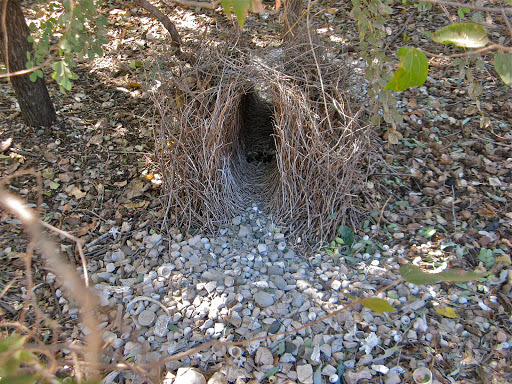 A Bowerbird's bower which has been at the same spot for more than 30 years and used by successive generations of Bowerbirds. Left Windjana after lunch and headed back up the terrible track to the GRR. The GGR turns out to be just as bad and we can barely sustain 30kph and that's with almost flat tyres and soft airbags, and still the corrugations are shaking us (and more importantly the Oka) about violently. We are camped at Apex Creek near the Mount Hart turn off. 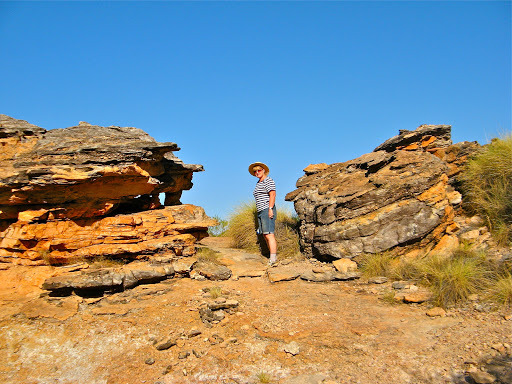 According to Dave, near here the very first Taipan snake in Oz was found. Hopefully we won't find the second one. Looking around the Oka I noticed some oily splashes on the inside of the front driver's side tyre. I think it's brake fluid so I checked the reservoir and both are quite full but one is slightly lower than the other. It appears it might be a brake cylinder seal which has wizened with age. Assuming no more leaks over night, we'll continue on and top up the reservoir as necessary. I don't have any brake cylinder seals with me and even if I did, a brake overhaul is not the kind of job I'd like to do on the road side. Some seals and bleeding kit are now on my to do list for next time. Before then I'll replace all four cylinder seals. ...and some lapses of map-makers attention. Black Oka 212 rushed passed our campsite just before dusk and then a few minutes later rushed back again to join us. 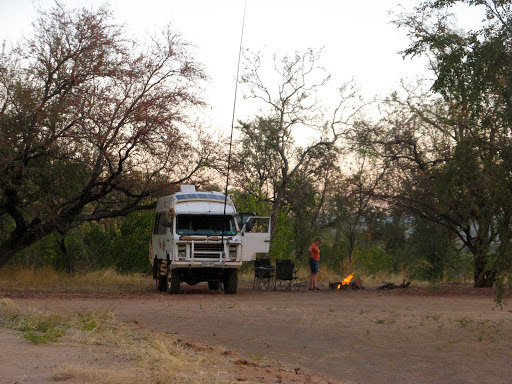 However our camp area has been burnt out and there is no firewood here which he wanted for his camp oven, so after looking at our map for March Fly Glen about 18km further on, they rushed off again as it was quickly getting dark. Left Apex Creek and carried on up the atrocious corrugations and had a break for lunch at Adcock Gorge, only about 50km up the track. Met C&R who'd been for a swum (swim in Oz). Walked to the gorge for a paddle over a difficult rock-hopping trek. After lunch attacked the GRR again only to meet a grader and smooth sandy gavel like bitumen thereafter for a 100 kms. Luxury. Camped at Barnet River Gorge alongside a nice babbling brook and rapids. J did washing of course. C&R passed by but camped nearer the actual gorge. I checked the brake fluid leak again and it had stopped and the reservoir had not gone down. I checked the actual fluid that was leaking and I now know that it's not brake fluid but diff oil which has seeped passed the drivers side oil seal in the diff and run down the wheel. The fact that is was dripping off the brake disk had obviously confused my tiny mind. Diff leaks I don't mind, I know what the problem is and can keep topping it up as necessary. Nevertheless, I will keep the seals on my todo list for next time. Fixed the rear a/c fans which had stopped working yesterday. In these hot conditions we need all the a/c we can get. After removing 500 screws on the rear cover and checking all the wiring, the problem was finally found to be a bad relay connection under the dashboard, and only needed being pulled out and reinserted, so then all the 2000 screws now had to be re-installed. C&R called by, inspected our campsite and decided to stay the day there since it was so nice. We stayed another day as well since J wanted to complete the washing. Had a couple of nice "floats" in the pool since it really wasn't deep enough for swimming, but was nice and cooling. J finished ALL the washing including the sheets. Casually looking around the Oka I noticed the front drivers side shock absorber looked a bit wonky and when I touched it, it moved. That was unexpected, as it's bolted top and bottom with large 24mm bolts, and when I investigated further, I found the bottom mounting bracket had broken off the spring mount. 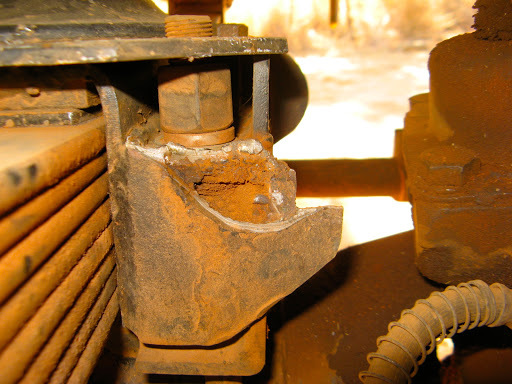 I removed it and inspected the break and decided that the welding gear I had with me could not have repaired it sturdily enough to withstand the shock loads on outback tracks so I removed the shocker entirely and would continue on with 3 shockers and see how it went. If necessary I could get it professionally repaired in Kununnurra. Even if I had continued with the welding repair, it would have meant a major disassembly job on the suspension, removal of the 3 car batteries, connecting them in series and fashioning a bush welding system. It could certainly have been done but didn't seem to be worth the effort. The car will run quite happily (albeit a bit bouncily) without a shocker. We have airbag suspension all round and that will provide some of the functions of a shock absorber anyway. Oka 212 called by and we had a good chat but they were heading for Mount Elizabeth so soon departed. Late in the afternoon, a car of aboriginals stopped at the junction of the track and shouted several times in our direction, "Hey whities, got any grog?". It's just that kind of cultural behaviour that so endears our indigenous cousins to the rest of the population. Perhaps I should have gone into their community and shouted "Hey blackies, got any shock absorbers?" Can't begin to think how many bylaws and injunctions I would have broken doing that. Isn't it wonderful that we are ALL Australians, equal under the law? Had TV dinners around a nice campfire with C&R and and an evening's chatter and laughter. Even though we are well into the tropics at 15º south, it still gets chilly at night requiring a jumper and sometimes long trousers. During the day the sun is blisteringly hot but the temperature only reaches around 30º. Gave C&R a copy of our map DVD's for use on their vomit-green coloured Sony laptop. The files wouldn't load initially and I'm not surprised with that colour scheme. 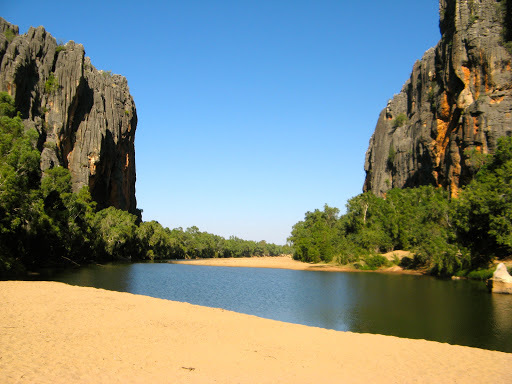 C&R are heading back to Manning Falls vowing not to stay at the campground at $20 a night, each! Prices for camping are getting astronomic. Camping used to be an economic and enjoyable way of exploring and enjoying the scenery and solitude of the countryside but is now getting ridiculously expensive. No wonder more and more people are using rest areas and semi-legal camping areas. 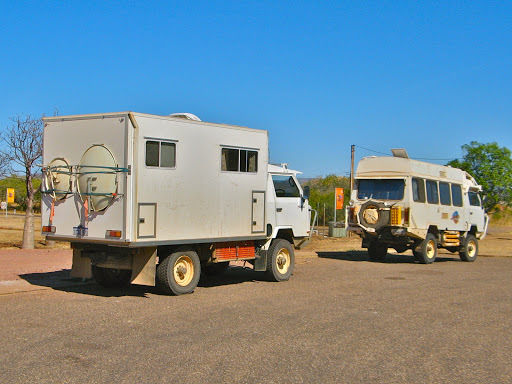 It's not meanness or being tight but after spending thousands of $ on a fully self-sufficient motorhome with official "Leave No Trace" certification, why should we then have to spend $30-40 a night on facilities we don't need or don't want or can't use? The increasingly common practice of funnelling tourists into expensive camping/caravan areas by the copious erection of "No Camping" or "Day Use Only" signs is an invasion of our freedom of choice. We have a right to drive on the roads both day or night but can only stop or park on them during daylight. What awful things can we possibly do at night that we couldn't do during the day? What's next, a prohibition on baking your own bread so you are forced into the local bakers shop? Why does the expression "killing the golden goose" so readily spring to mind? We'll continue to spend our funds on the basis of "value for money" and no matter how enticing a venue might be, that will always be our deciding factor and if something is worth it we'll happily pay for it. Successful tourism should be measured, not on $ per person extracted, but on tourist enjoyment per $ spent. Surely that's the only sustainable approach? 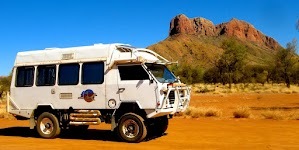 Examples: A boat trip out to swim with whale sharks at Ningaloo reef, a helicopter flight over the Bungle Bungles, or a full day's flight over the north Kimberley coastline were all very expensive adventures ($x00's each) but all well worth it and fitted the value for money criteria. A night in an overcrowded Big4 caravan park , $32-52 a night, with toilets, showers, camp kitchens, jumping castles and all the other things we don't need is very poor value for money. Which things are you going to rave to your friends and family about when you get home? A hump backed whale suddenly appearing in front you while snorkelling, the sight of the Horizontal Waterfalls in full flood from the air or the grubby toilet block in an overcrowded caravan park? Meanwhile we carried on up the GRR finding a good lunch spot alongside the Kennedy Creek. Would have been a great campsite as well but it was too early to stop. We passed by the Kalumburu Road turn off, where we were only 60km away from the spot where we broke a spring bolt in 2007 and spent 25 hours on the side of the road fixing it. We saw no reason to revisit that site. The track is now getting rougher. The graders have long since departed and the surface is rocky and rough although not yet as corrugated as the western section. 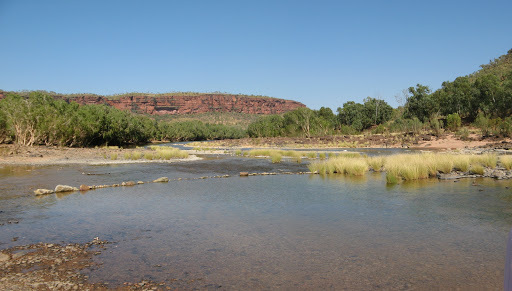 At mid afternoon we crossed the wide but currently peaceful Durack River and should have camped there last night but I knew better, I thought, and we moved on. 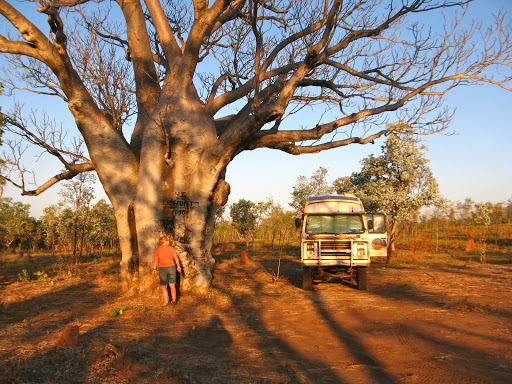 On the eastern section of the GRR the cattle stations (Gibb River, Ellenbrae, Durack, Home Valley Stations) are all aboriginal owned and they don't allow camping anywhere along their sections of the road, only at their expensive and widely separated camping grounds. (See rant above). So the only option in this remote part of the world is to bend the rules and stay just off the road, out of sight, in, say, a gravel scrape? So that's where we are, well hidden about 30m from the road, in a former gravel extraction area, nice, flat and sheltered, fully revegetated with bushland and really quite pretty, but possibly illegal. Day 26 since we last saw a cloud. Out of 67 days so far only 4 have been cloudy (Yulara, CSR, Warroora Station and Wittenoom) and only twice have we had a shower of rain (Yulara and Warroora). Stopped at Waterlilly Creek for morning tea, and then lunch. It was a nice spot with no overt "No Camping" signs and would make a good campsite. Lots of Grevillea Robusta trees around here (Silky Oak) in full bloom and full of honey eaters. We thought they only lived in QLD where we've seen forests of them but apparently they are endemic to this part of WA as well. 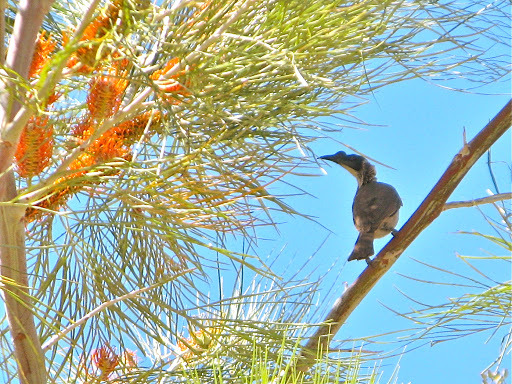 They have beautiful yellow flower spikes which attract honey eaters where ever they grow. The species here is the Helmeted Friarbird, not the most attractive bird with a large lump on the top of their beaks, but certainly different. The GRR is deteriorating the further we go away from the grader site. In fact it reduced to a 20kph max bump over every corrugation. The good news? 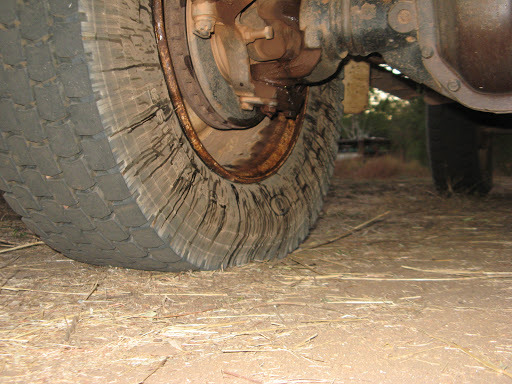 is that the lack of one shock absorber has made no noticeable difference to the performance over corrugations. Maybe on bitumen with higher tyre pressures bouncing will become more noticeable, but right now I'm planning on doing nothing to the broken mount until we get home and can do/get it done properly. The chassis on an Oka is very stiff and 5 shockers (we have pairs on the rear wheels and one on each front wheel) is almost as good as 6, and the airbags provide additional support anyway. 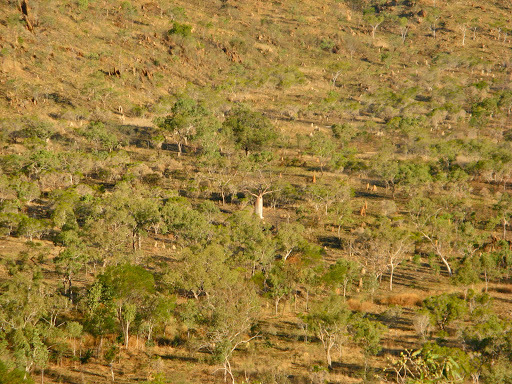 We stopped to photograph the Cockburn Range of hills above and beyond the Pentecost River. They're always a spectacular sight, especially in the afternoon sun. Later we bumped and sploshed our way across the 1/2km wide rocky river bed which was about 1/2 meter deep, but posed no problems. Previous crossings here have been deeper and more difficult. 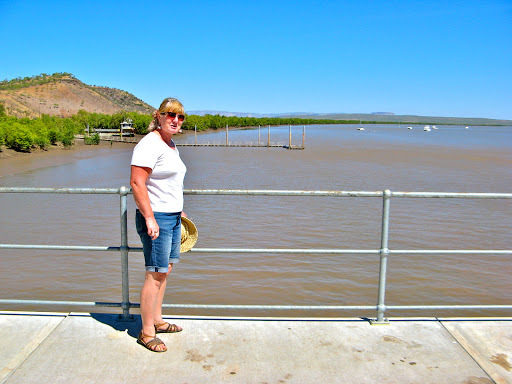 Having looked for a campsite on the sandy western banks of the river and found nothing suitable, we searched and found a superb flat campsite on the eastern side on a bluff overlooking the river. There's the remains of a good campfire here and plenty of wood so we're having a Pentecost Campfire here tonight, and the last of our wine stocks. Kununurra tomorrow which has a bottle shop of sorts, but access to alcohol is very restricted and expensive in all parts of northern Australia due to the tiny minority who have a problem, no cask wine of any size, only expensive bottles and a limit of one per person per day, and no fortified wine (port or sherry) either. Whatever happened to democracy where the will of the majority becomes the law for all? Did something change while we weren't looking? 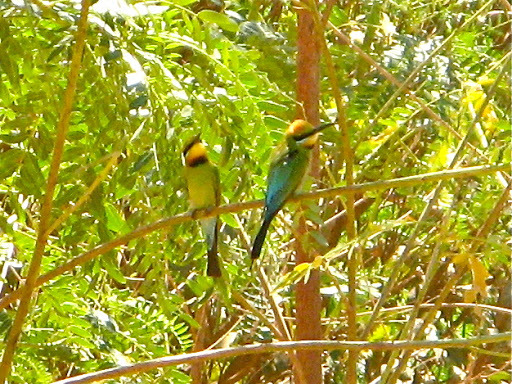 Kununurra. 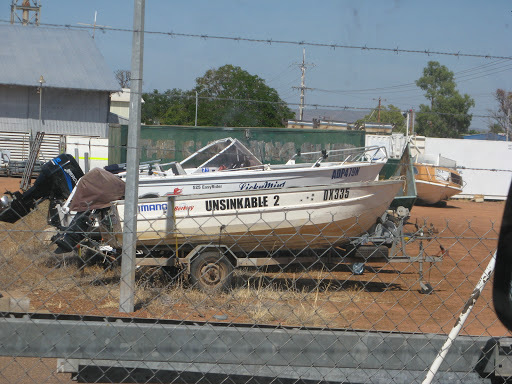 Well actually no, we didn't get to Kununurra, yet. 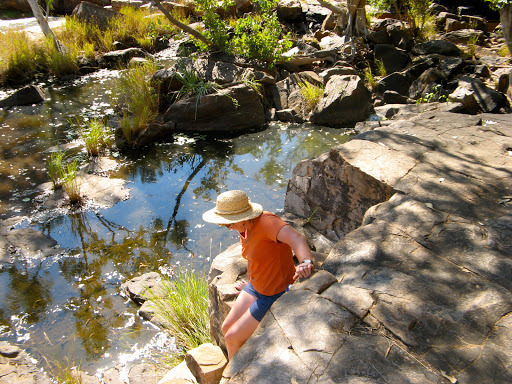 The track from the Pentecost River to El Questro was the normal very average corrugations and/or very rocky and rough. From there to the Northern Highway, a second parallel road is being built with multiple detours on to dusty side tracks. 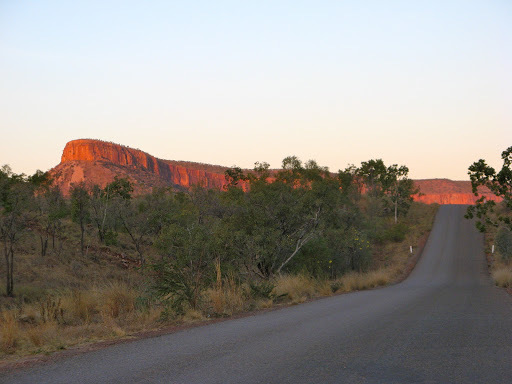 (Cynics would say, with some logic, that this road is being upgraded only to service the commercial ambitions of the owners of the El Questro resort and it does seem very coincidental). They were even sweeping a new section of gravel road which made the dust even more dustier than usual. On reaching the highway we (ie, me) decided to zoom up to Wyndham, since it was only 50km and is the most northerly town in WA. Also fuel is normally cheaper there since it's imported through Wyndham for distribution to other Kimberley centres. Oka 212 who we had criss-crossed on the GRR passed us heading back the other way. We drove right through the town until all bitumen finally ends in WA, 3200km from Perth, at a new mining port where ships were taking on what seemed to be gold ore, but we could be wrong, it didn't look like iron ore or diamonds. 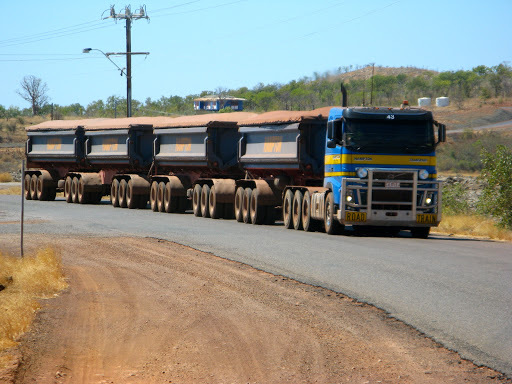 There's certainly a lot of new mining activity in the Wyndham area as judged by the number of ore road trains we passed and the several new port facilities being constructed there. After visiting their newly opened Community Fishing Jetty, we stopped at a small park for lunch and spied Tony Lee's Oka outside a Bits and Pieces shop. We met for a chat and had a good hour with Tony and Betty discussing Oka matters, as you'd expect. They were sitting in Wyndham waiting for a replacement inverter to be delivered from Melbourne, a long wait they feared, before heading up the GRR and Mitchell Falls. Why was he in a Bits and Pieces shop anyway? Well apparently he left a cable out connected to his satellite dish and a dingo chewed through it, so they were acquiring (successfully surprisingly in such a small remote place) a replacement. We had a mutual look through each other's Oka developments and took photos for the "Spotted and Oka" segment of the website forum and went our separate ways. After refilling with 130 litres each of fuel and water (and 17 slices of bread, for we had none left), we set out south and diverted off left to Parry Lagoons, a RAMSAR protected series of billabongs and wetlands on the expansive Ord River flood plains which are in their dry season. A myriad of water and land based birds live in and around the waters including Brolgas, Finches, Kites, Storks, Jacanas, Herons, Cormorants and ducks of many species. 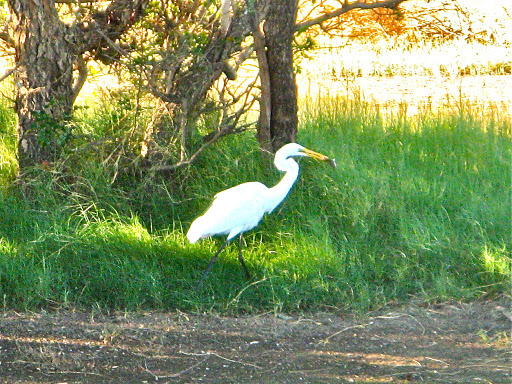 We spent a couple of hours at Marlgu Billabong, including watching an Intermediate Egret catch and eventually swallow a large fish (species unknown), before camping well way from the water so as to not disturb the birdlife. 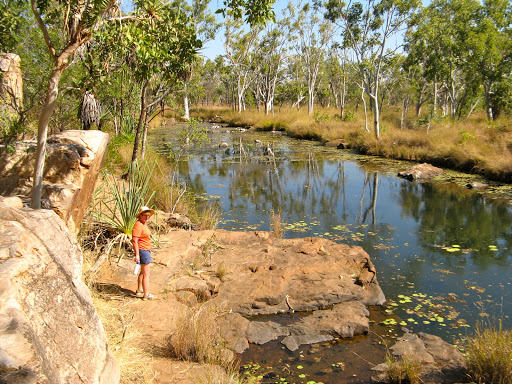 There are other places to visit in this reserve tomorrow before eventually heading for Kununurra only 80km away. 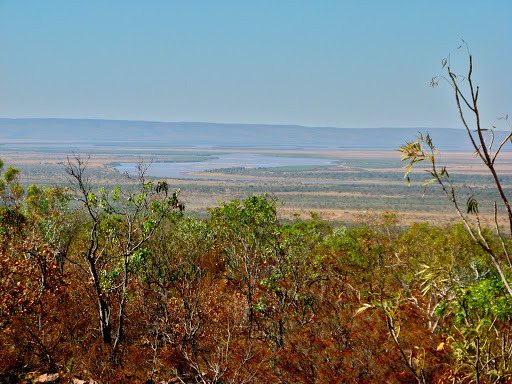 The Parry Lagoons road east of here is the original Wyndham to Kununurra road before the highway was built 30km south, so we will give the old track a go. 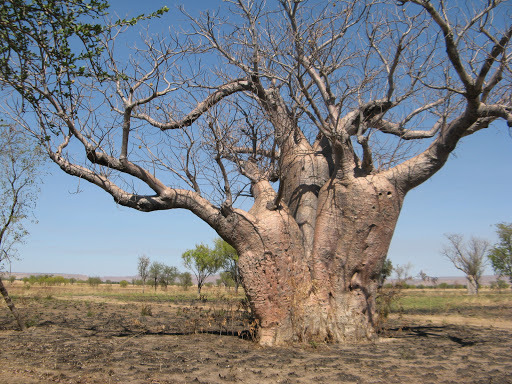 On the way we passed several huge groves of young Boab trees, still with their summer leaves on, and a few large majestic ones without. In case you're interested at all, driving the Oka with only 5, instead of 6 shock absorbers has made almost no noticeable difference. With a full load of fuel and water, and hard tyres, it felt a little bit bouncier but that's normal for a full load. As we progress east, the time difference is becoming more obvious. The sun is fully up and blasting though the windows before 6 am and it's dark at 5pm. Well have to do the timezone dance again soon which is very confusing for all concerned. We are actually around the same Longitude as Eucla on the Eyre Highway and 15º lower in Latitude, although a lot more degrees than that warmer in temperature (29.5º at 9am). Eventually we'll have to turn south, a thought that fills us with dread, temperature wise. Day 28 since we saw a cloud, ho-hum. 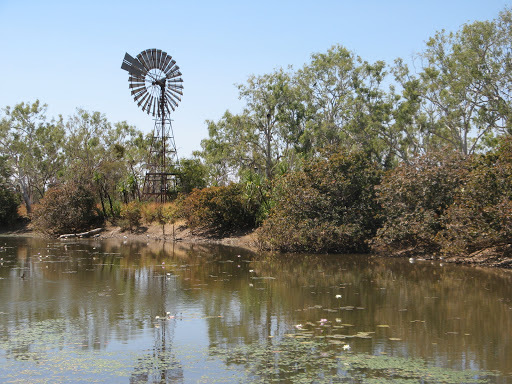 We carried on around the Parry Lagoons reserve to the old highway and looked in at the Parry Farm Resort. It looked OK as a camping area but the lagoon alongside it was devoid of birdlife, which, after all, is what these lagoons are all about. The "old highway" east, (Parry Creek Road) was pretty rough but there were plenty of good looking groups of boabs which had to be photographed and we came across a good spot for lunch down a boat ramp alongside the Ord River, complete with crocodiles. They looked like logs on the far sandy bank but weren't there a few minutes later. It would make a good camping spot but it was way too early for us to stop. We called in at Button Crossing, a very sandy former crossing point and Black Rock Falls, which were dry except for a small pool at the bottom. There were zillions of butterflies foraging for water on the moist, fern covered sides of the rock wall. We expected to reach Kununurra today but with so many stops we didn't make it. We are camped at Middle Springs in quite a nice tropical setting. ...and one of its inhabitants. Leaving Middle Springs we'd gone only a few hundred metres when the phone rang. It was Scott and we had a good looooong chat for an hour since we hadn't spoken to him for several weeks. After starting off, less than 50m later the phone rang again. Alan this time, so we had another 20 min chat with him. 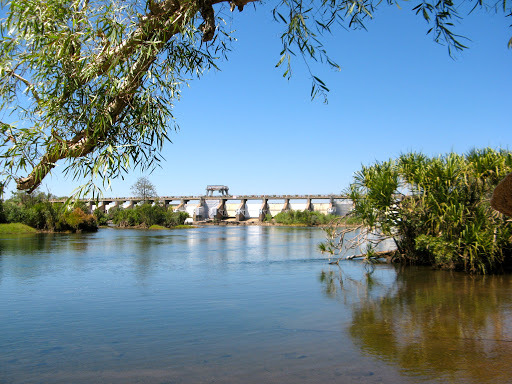 We called into Valentines Springs but they were not all that great since they lacked adequate water, so we stopped for lunch at a boat ramp below the Kununurra Diversion Dam. 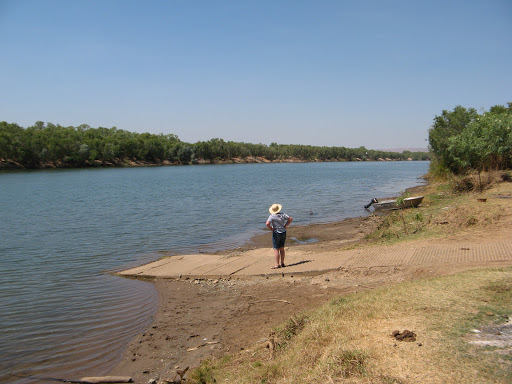 The Ord river is a beautiful water way, pity crocs think so too, so a swim is out of the question. So finally, after 3 days of trying from Wyndham we finally reached the safety of the Kununurra shopping centre. 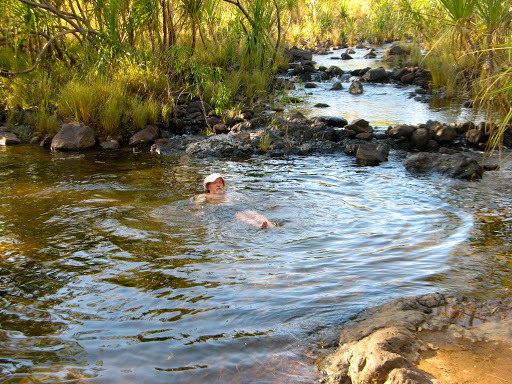 The CP's in Kunu are all very overcrowded and the town is not as nice and relaxing as it used to be, so after exposing our credit card to Coles (see strip down joke below) we retreated back to a nice secluded gravel scrape we found several years ago to camp. While we were there we saw C&R rush past but due to our seclusion they didn't see us. When I was ready to pay for my groceries, the cashier said, "Strip down, facing me." Making a mental note to complain to my M.P. and local councillor about Security and policing running amok, I did just as she had instructed. After breakfast as we were packing up, we saw C&R rush back the other way, they must have camped up the track further on, I tooted my horn but they didn't hear it. We dawdled into Kunu to see some other places and called in at the Dunham River bank but it had all been burnt out, as was much of the land around Kunu (but see tomorrow's headline story below). 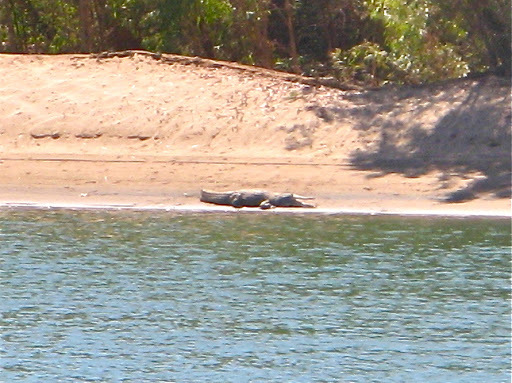 We found the Swim Beach on the Kunu lake above the dam which is claimed to be croc-free. And there were C&R doing their GST returns for their pub in NZ. You can take the Kiwi out of NZ but the government will get you anywhere. So we had another chat and then it was lunchtime. So for 2 days running we had failed to reach Kunu before lunch. Who's he kidding with all those big scaly things that love the sound of boat propellors? We toured around Kunu and did a bit more shopping. Considering this is a premier agricultural area, the produce in Coles wasn't that good so we sought out the IGA which actually had locally grown produce, not produce from a national distribution centre. After visiting a few diamond shop windows, we noticed smoke issuing just beyond the town centre. 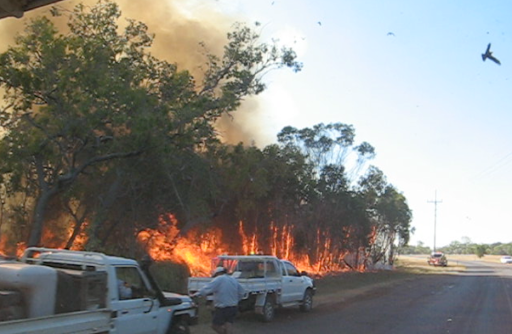 A fire had been set very near to the Hidden Valley caravan park and remarkably close to an aboriginal housing area. 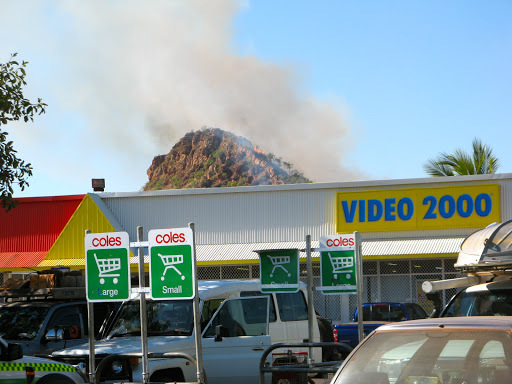 When we drove past it, the hillside was ablaze and the roadside fire was very hot on the face. Why are we not surprised? We camped back at the gravel scrape and C&R joined us for drinks and nibbles. Leaving Kunu we headed east across the WA/NT border and forward 1 1/2 hours in timezone. Now lunch comes immediately after breakfast. 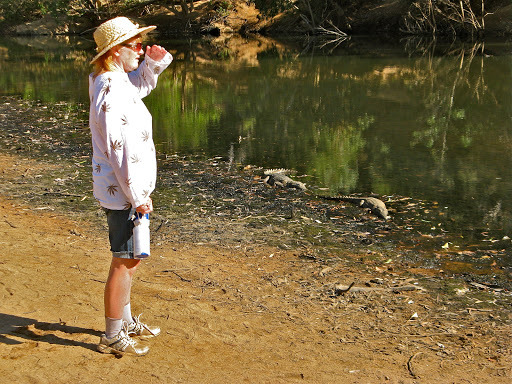 We turned left into the Keep River NP and had lunch and a bit of a bird watch at Cockatoo Lagoon. All the usual suspects, including 4 spoonbills, even though the water hole is gradually drying up in the hot dry season weather. 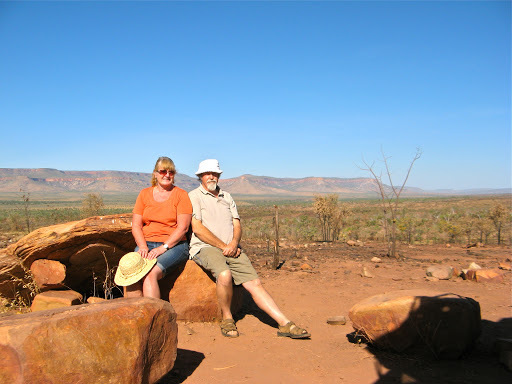 We camped at Gurrandalng Campground and planned to do the short sandstone walk in the morning when it would be a bit cooler. Up early (due to the timezone) and hit the walking trail by 8am (but whose?). 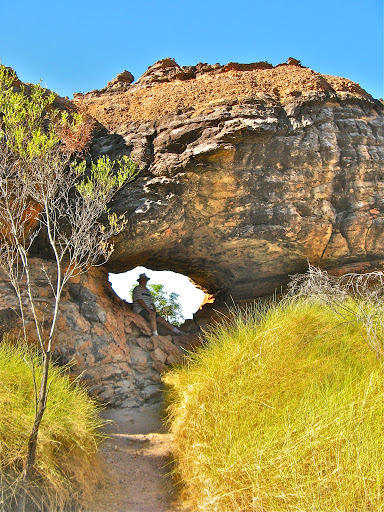 This walk we've done before but it's a magic 2km track through sandstone rock formations, rocky vistas reminiscent of the Bungles and 3 m high spear grass plains. Part way along, there is a bridge crossing 2 rocky spurs and in true dreamtime spirit I believe I know the true story. A very long time ago, before the internet, 2 young men on a hunting foray met at the rocky spur. One was a slim lithe warrior with many enemy scalps that would have been hanging around his belt, if he had one, and the other was a larger sluggish bully-boy of the tribe who wouldn't allow the smaller man to go first, even though he had earned that right in many tribal wars. In the fight that ensued, in true David and Goliath fashion, the larger young man completely smashed and unfairly flattened the smaller warrior to the ground and he fell across the rocky spurs and was transformed into the bridge we see today. The larger bully-boy young man then trampled across the bridge and was surprisingly fated and flourished and went on to aspire to be the tribal leader of the new continent of Ozralyia much to the dismay of all the other working families of the tribe. After one of our lunches, we headed east towards Timber Creek. I've never liked TC very much, it's just a highway with a few buildings scattered along each side of the road. 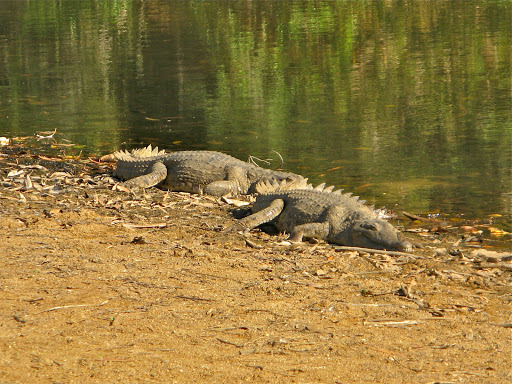 The Victoria River and the gorge is a very pleasant sight though as long as you don't venture too close, big scaly things live therein. 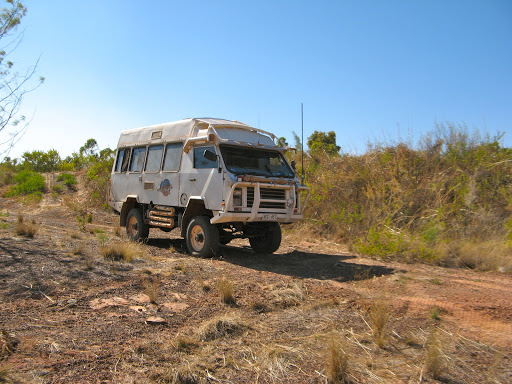 The huge Gregory NP encompasses the road for about 100km and all the rest areas along the highway are now NP campgrounds. They used to be free but are now charged for as if they were in the deep of gthe park but even worse, being close to the road they are very congested with caravans, which is not what NP's are intended for. 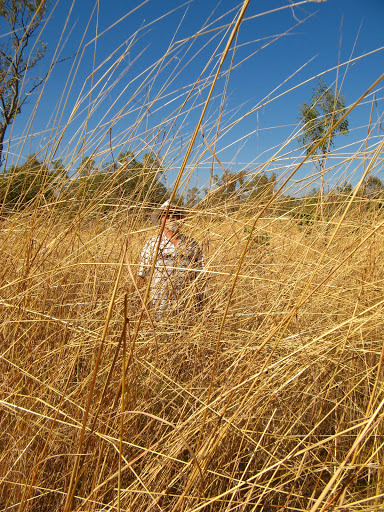 So we abandoned those caravan slums and found a small reserve around a huge boab just east of TC and had a quiet night. 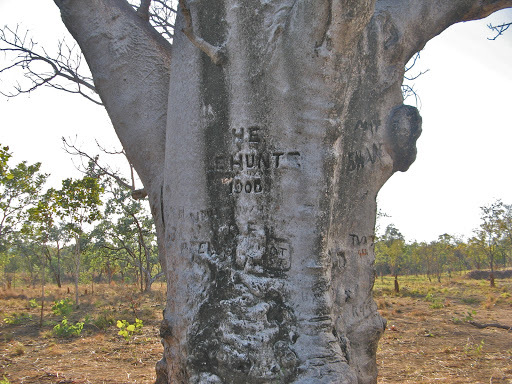 The tree is very old and covered in historical graffiti, including the name of Sir Gorge LeHunte, governor of South Australia in the early 1900's (which included the Northern Territory back then), whose name was carve by one of his aides (a Mr Hood) in 1905 during a regal visit. So the actual carving is a bit confusing, [H.E. : LEHUNTE: 1905], presumably the carvers initials and the carvee's names. We'd have gleaned more but the whole area (as with much of the land along the highway, which is aboriginal land, has been burnt out, including the potentially informative plaques. 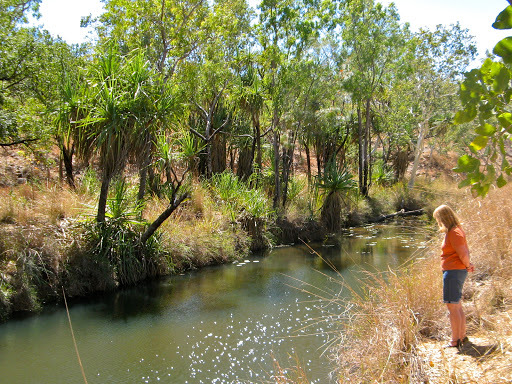 Continue our trek here, from Timber Creek to Tennant Creek via Katherine. The photographs are depicting that you had very good time out there and have such beautiful places to walk and explore.